Ford’s herrezen Vignale-merk bestaat al sinds 2015. Het herbergt nu bijna het volledige modellengamma, van de Fiesta supermini tot de vlaggenschip Edge SUV. Wij (AutoExpress.co.uk), reden met de nieuwe Ford Focus Vignale in de UK, maar is het de premium-badge waardig? Tot nu toe was de verchroomde Focus opvallend afwezig, Ford-kopers die op zoek zijn naar een chique familieauto zijn gedwongen om naar de grotere Mondeo- of Kuga Vignale-modellen te gaan. 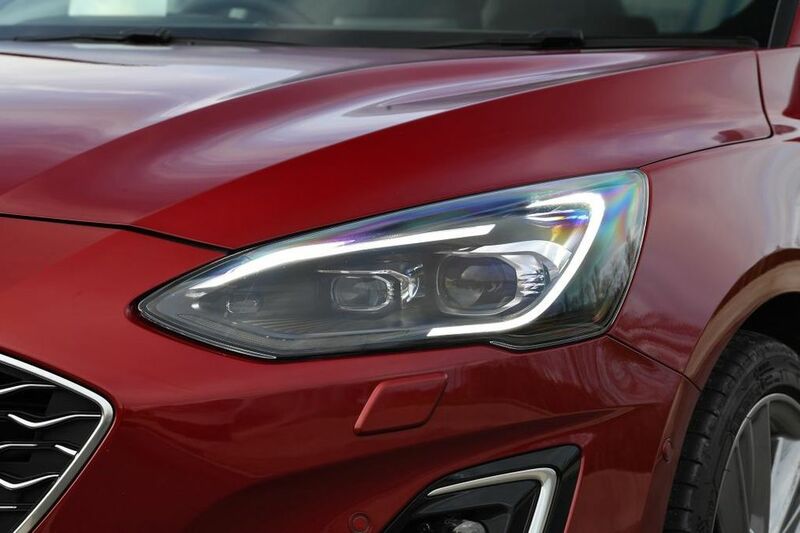 Om dit gat te dichten, zal de geheel nieuwe Focus Vignale de komende weken bij de UK dealers verschijnen. Ontworpen om boven de vorige Titanium X-reeks topper te zitten, biedt het de kopers net een beetje meer van alles. Een beetje meer luxe en een beetje meer kit, en onvermijdelijk het kost ook een beetje meer. 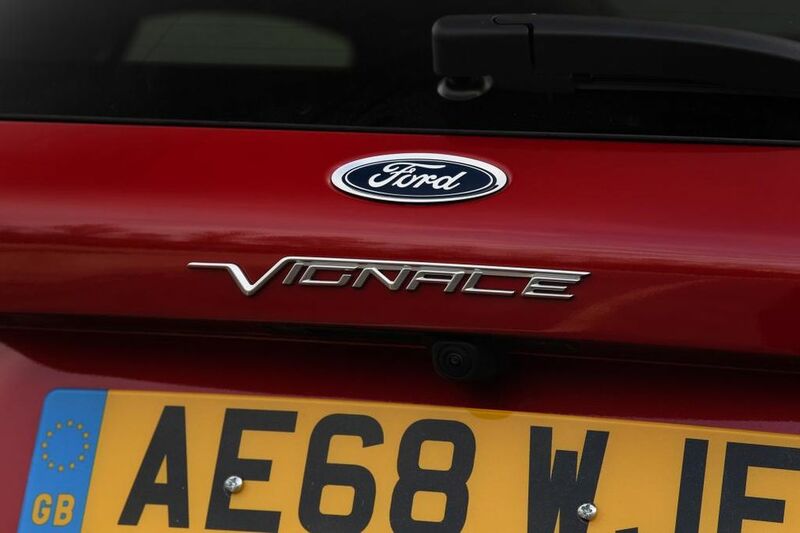 We drive the new Ford Focus Vignale in the UK, but is it worthy of the premium badge? Ford’s resurrected Vignale brand has been around since 2015. 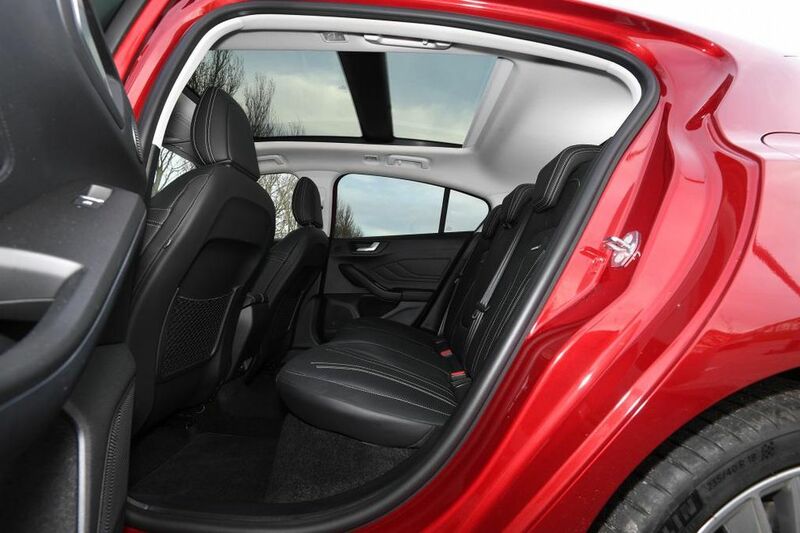 It now spans almost the entire model range, from the Fiesta supermini to the flagship Edge SUV. 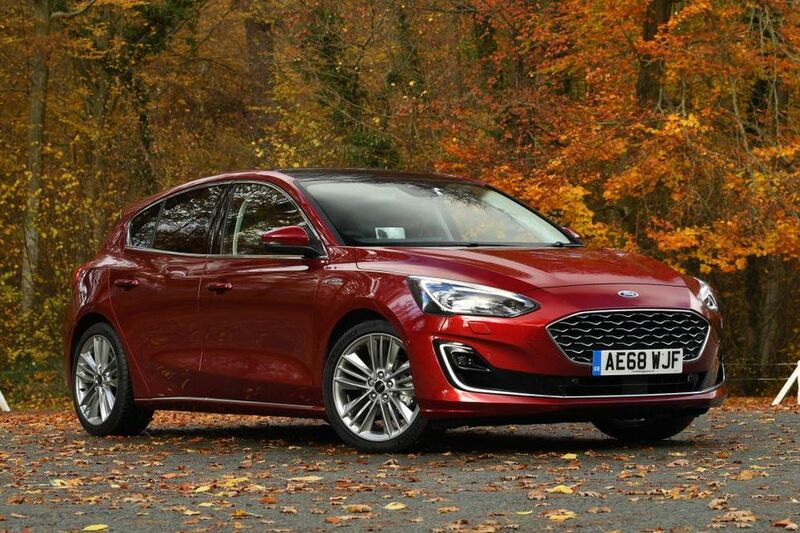 But until now, the chrome-covered Focus has been conspicuous in its absence; Ford buyers in search of a posh family car have been forced into the larger Mondeo or Kuga Vignale models. 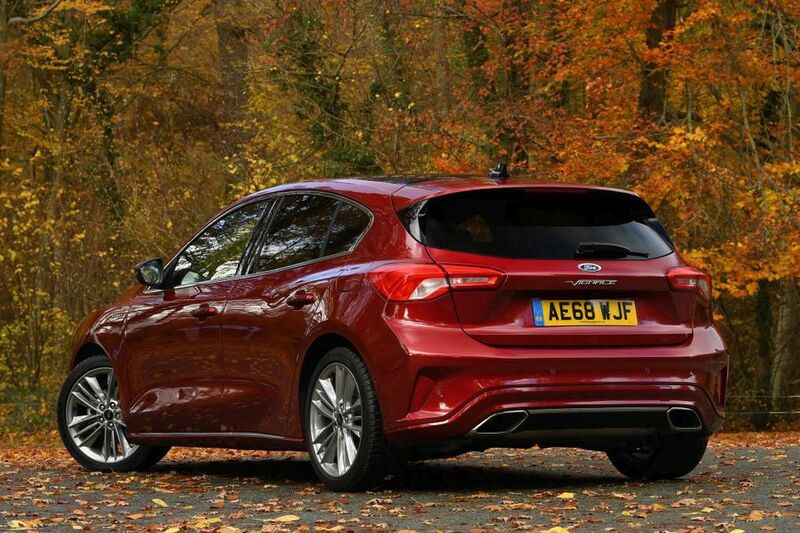 Keen to rectify this, the all-new Focus Vignale will appear in dealers over the coming weeks. Designed to sit above the previous Titanium X range topper, it offers buyers a little bit more of everything. A little bit more luxury and a little bit more kit; inevitably it costs a little bit more money, too. Prices start at £25,800 – or £2,670 more than the equivalent 1.0 EcoBoost 125PS in Titanium X guise. That price difference remains pretty much in step throughout the range, right up to the flagship diesel, which costs from £29,550. 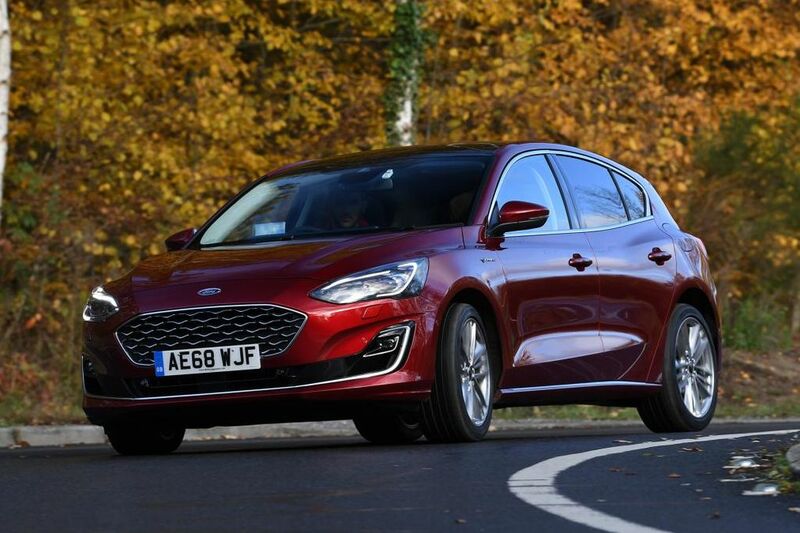 We tested something of an anomaly, however, as the middling 148bhp 1.5-litre EcoBoost fitted to our car has just been dropped for the Vignale. Instead, you’ll have to step up to the range-topping 180bhp version as per our spec panel. Look at the costs on a PCP finance deal and you’ll be paying roughly £52 more per month for the flashy Vignale with the entry-level engine and gearbox combination. Higher rate company car drivers will fork out another £28 per month in BiK tax, too. So whether you consider it good value for money, will depend largely on the added equipment the more expensive car offers. But the cheaper Ford Focus Titanium X is already a well-equipped car. 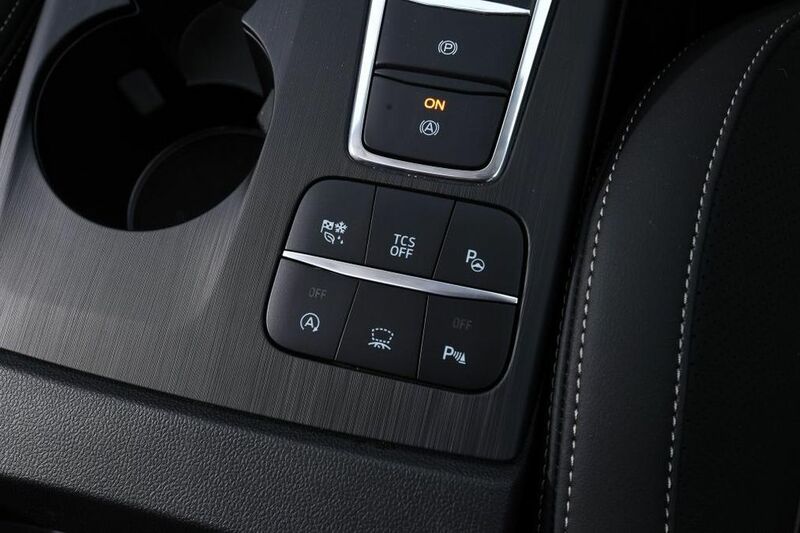 You’ll find 17-inch wheels as standard, as well as front and rear parking sensors, automatic lights and wipers, dual-zone climate control and part-leather trim. Ford’s latest SYNC3 infotainment system is also included, featuring sat-nav, Apple CarPlay and Android Auto. 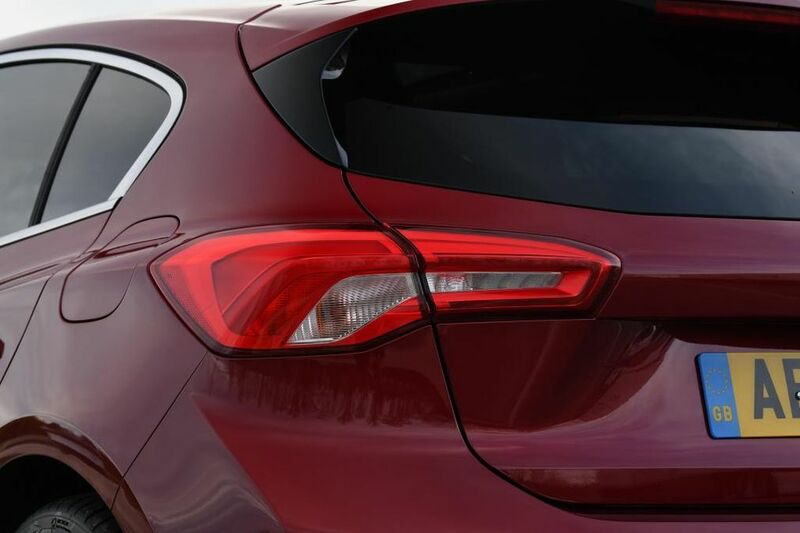 Vignale models like ours then add larger 18-inch wheels, LED headlights, a wide-view reversing camera, heads-up display and Active Park Assist. That’s a lot of kit for your cash, whichever way you look at it. 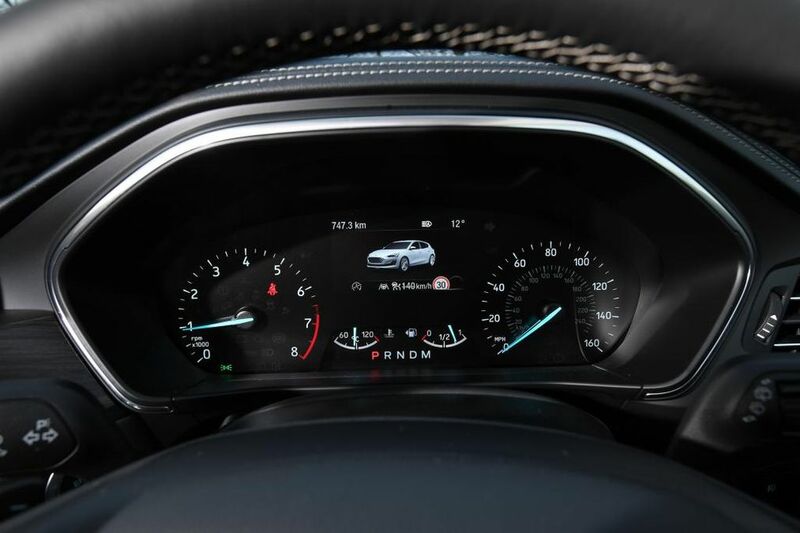 On top of that, there’s full leather trim with Vignale badging, a B&O sound system, multi-colour ambient lighting and bespoke exterior styling. 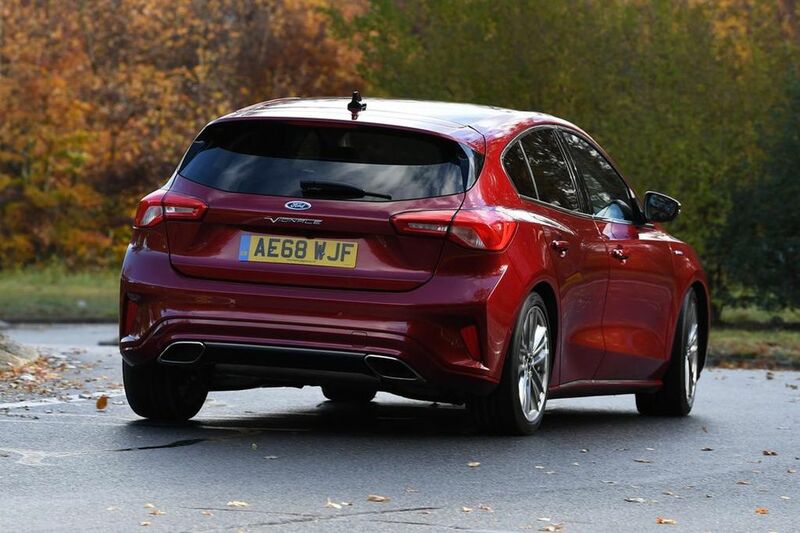 Speaking of which, Ford has consciously made the latest Focus Vignale look a bit sportier than its siblings. There’s less chrome and more body-coloured trim, while the chunkier bumpers and big wheels give it a more aggressive look. It happily occupies a middle ground between the grown-up Titanium and the racier ST-Line models. Inside, you’d expect the Vignale to feel posher and better built than the standard Focus models given the premium it commands. 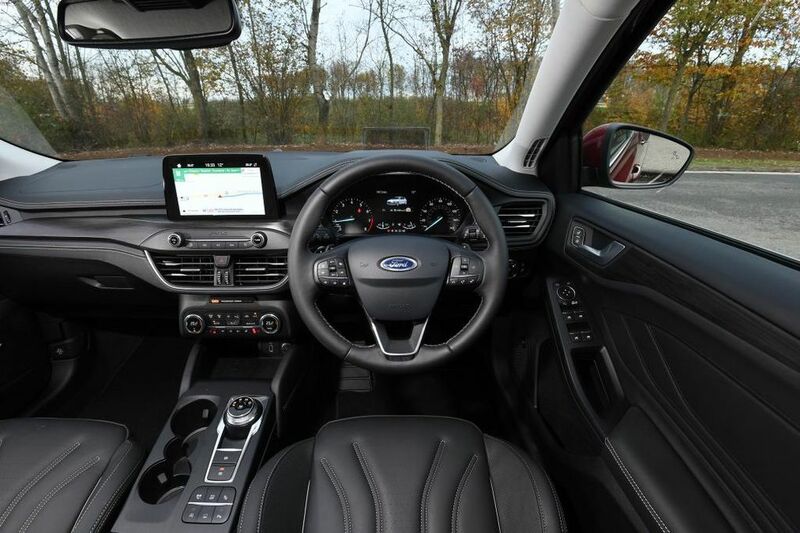 You’ll notice the contrast stitching on the dashboard and the comfortable leather seats, but aside from that it’s standard Ford fare. While that may sound like a negative, it’s actually an acknowledgement of how well built the latest Focus feels. There are still a few scratchier plastics around the lower centre console, but it appears almost as plush as a comparable Volkswagen Golf or BMW 1 Series. 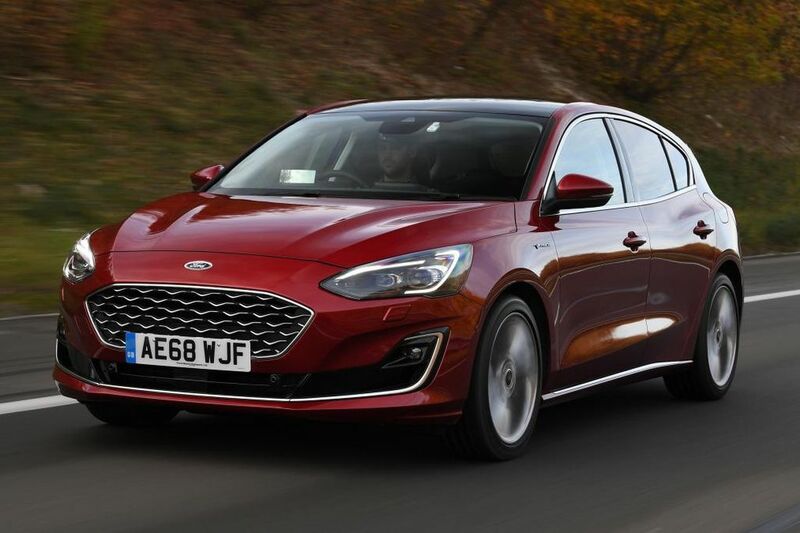 To drive, the Vignale is just like any other new Ford Focus, as well. 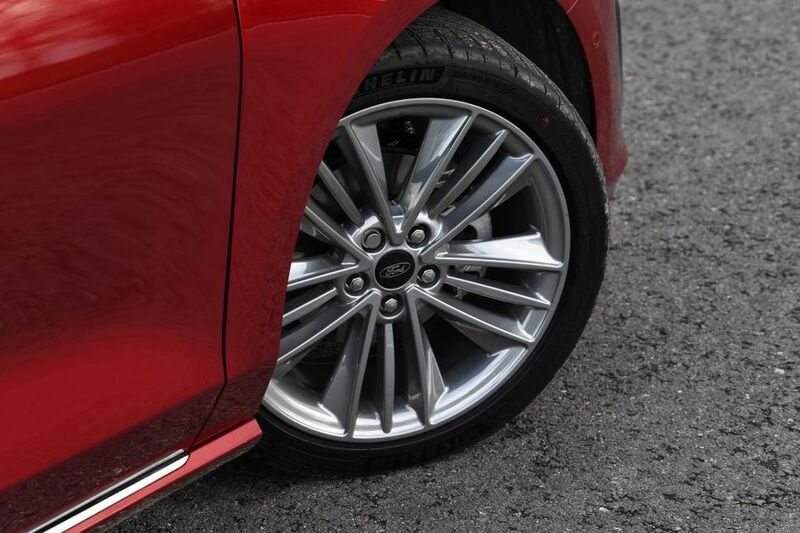 That is to say it’s dynamic, comfortable and relatively quiet – although the larger 18-inch wheels can generate some quite unpleasant tyre roar on harsher surfaces. The steering is weighty and direct, while the ride is nicely damped, too. While our car’s unicorn spec means we’re unable to comment on the new 180bhp 1.5-litre EcoBoost engine for now, our experience with the 148bhp car (tested here) and the entry-level three-cylinder would suggest the smaller unit suits the car better. The 123bhp 1.0-litre will be plenty quick enough for most buyers, while strong refinement ensures it’s a solid motorway car as well. 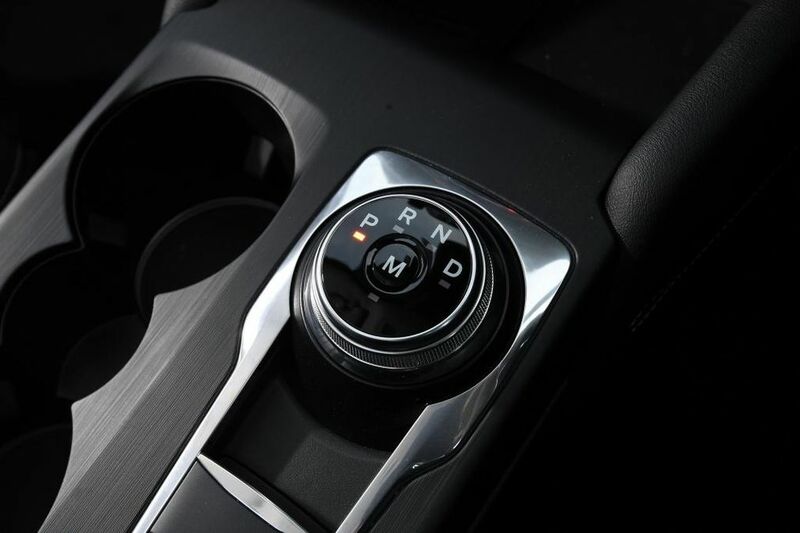 The auto box works nicely, but the six-speed manual is really sweet and plays nicely to the Ford’s dynamic ability. 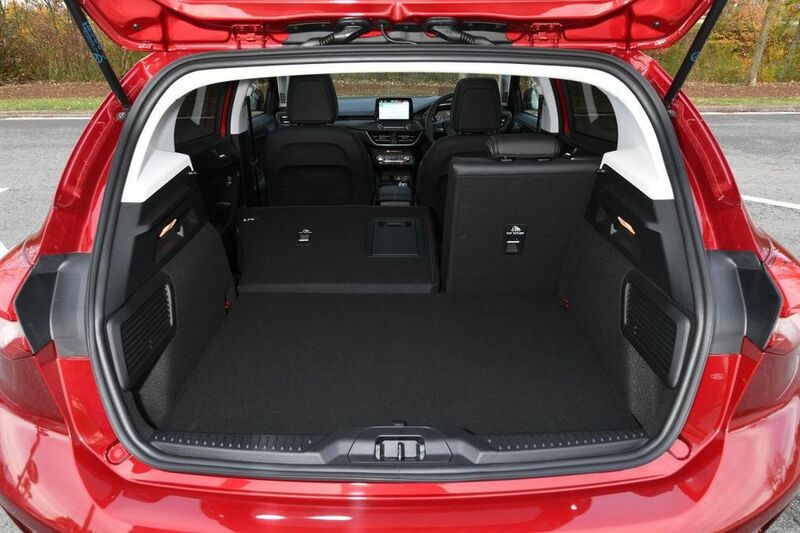 The auto will suit those whose journeys are largely confined to urban areas, however, swapping cogs smoothly. It rarely bogs down when you ask for extra power, either. It’d be easy to dismiss the Ford Focus Vignale as simply being too expensive. Yet people have been buying similarly priced BMWs and Audis for years. It offers a substantial amount of extra kit over the already well-equipped Titanium X, as well as plush leather, extra refinement and unique styling. Most will find the cheaper models sufficient for their needs, but this is the most convincing Vignale yet.